From California to Maine and beyond, these early adopter Cub Scout packs have ventured into uncharted territory with wildly successful results. At SeaBreak, Arrowmen from as far away as Minnesota and Colorado traveled to the Florida Sea Base in March to complete a week of hurricane cleanup. Scientists named a new species of spider after Eagle Scout Bill Steele in honor of his contribution to the collection of cave tarantulas in Mexico. If your Scouting job involves training other leaders, you should consider attending a conference at the Philmont Training Center. Getting trained on training is always a good idea. Boy Scout families — both current and former — can score $350 SAT or ACT test-prep computer programs for $20. That’s a high-scoring deal. How do you help ensure picking up trash doesn’t devolve into a way to simply fulfill service hour requirements? Pack 267 and Troop 267 in Fredonia, N.Y., have an answer. 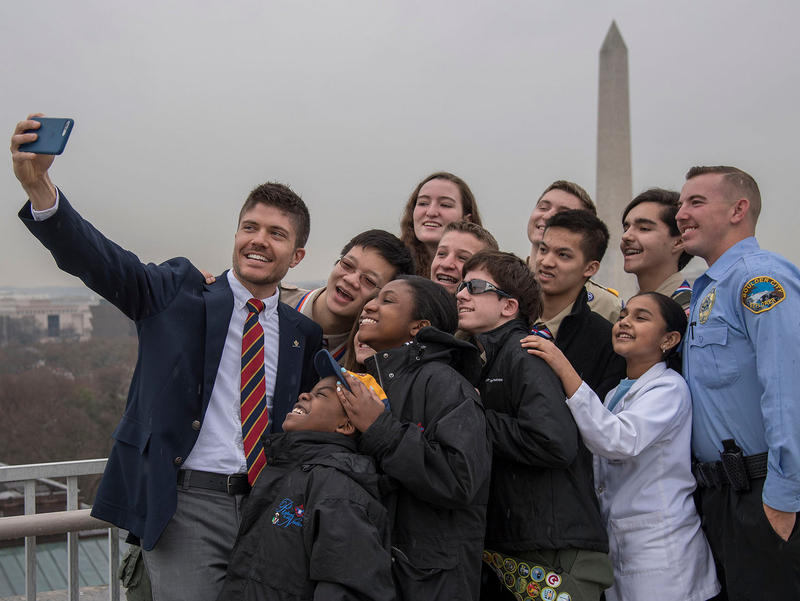 The six young people selected to serve on the 2018-2019 National Venturing Officers’ Association will play a critical role. Let’s meet them. Ryan Kelly won the 2018 Pulitzer Prize for breaking news photography for his searing image of the tragic events in Charlottesville, Va.
With a little creativity, you can make any location — basement or barn, cafeteria or conference room — the ideal venue for a pack, troop or crew meeting. This incubator of interplanetary innovation isn’t located in the obvious space places like Houston or Cape Canaveral, Fla. It’s in Huntsville, Ala.